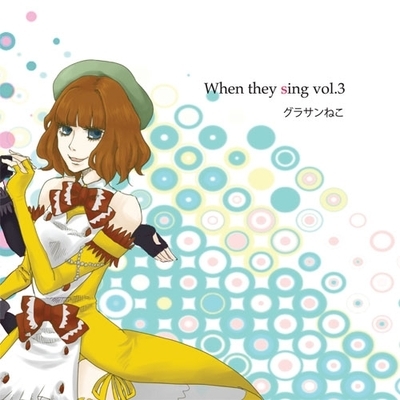 Aside from the horrendous cover art that can give Ryukishi a run for his money, this is the best entry in the “When they sing” series to date. I’m wondering if this has something to do with Miss Featherine Augustus? Maybe…Hanyuu turned into a trance/techno lover? That would explain the cover art for that one Higurashi Image Song Remix album of Nano Desu and K1’s song…anyways, I digress. This is a pretty solid trance/techno track, for starters, I actually like it. Usually when it comes to techno I listen to it once and move on (exception being EastNewSound), but this is the type of kickass techno I can rock out to (read as: spaz out to). A track that focus more in being what Umineko once was, creepy. It’s mostly the repetition of a drum beat and an incredibly quiet synth deep in the background. It feels like this track is trying to be somewhat creepy, but in my opinion it kind of fails. It’s a bit too repetitive and the song itself isn’t anything special, so I’d call this one skipable. A rearrange of one of the tracks that made its debut in EP6 IIRC. For those not familiar with the original, it’s a mischievous little track that sounds like it came from a brass band with a couple violins and wind instruments. The difference between this arrange and the original is that there a greater emphasis on the brass and a couple instrumental differentiations here and there. A relaxing piano and drums track. The melody’s pretty nice and I’d listen to it on a lazy afternoon (or a busy homework filled one) to calm me down and relax for a bit. There’s nothing really anything that stands out about this track, but it’s worth listening to on a lazy day. Although if I had to say something, the title feels extremely fitting for some reason. I just noticed that this is one of those words that is spelled the same both forwards and backwards. What do they call those again? Anyways, this is another well-composed techno track, and the beats are pretty fun to rock out to (read as: see previous read as). The synth guitar is pretty cool, and so is the synth backing around 2 mins. Heck, the whole song is cool. It’s repetitive in a good way, and I’d definitely say this track is worth listening to. WHAT DOES THE SCOUTER SAY ABOUT THE SYMPHONY LEVEL? IT’S OVER 9999999-/shot. Anyways, this is a rearrange of Endless Nine, that one song used in the EP4 Tea Party IIRC. This is a pretty awesome remix, changing the instruments to make it sound more like a symphonic orchestra is playing it. It’s a very cool track, and even manages to mix in Thanks for Being Born and Hope into it. It’s the type of layered piece that you’d love to hear at a symphony, with crescendos, decrescendos, pianos, fortes, and all those other musical terms in the right places. An incredibly grand piece that successfully goes way beyond the original piece, surpassing dai’s work. Although it is a rearrange so I can’t give them full credit, it’s a simply spectacular rearrange that is fully deserving of making the scouter go berserk. I didn’t know the When they sing guys composed this song. It’s originally a BGM from EP6, so I’m not going to say much about it seeing as it isn’t a new track. It’s a straight lift from the BGM, so it’s just as good as it was then. And since I’d say it was one of the best songs in EP6 (and considering that EP6’s songs were the best in the series), it’s pretty darn good. At first I thought that my computer messed up the title tags for this. But since all the other tags in the album were just fine, I’m going to assume that this title is just weird. A pure piano track that’s easy on the ears, but has a few odd accidentals here and there. I guess this is a pretty odd track overall, that kinda goes well with the odd title. I don’t really know. The previous track kind of leads into this one, but this track does well enough without the lead in. This is the type of track I’d probably hear for the BGM in some super escape event from a JRPG. In a good way. The mix of synth and piano sounds pretty good, and the melody is nice. The odd bass parts are pretty interesting, and the chaotic mood of the song makes me think “NO WAY” and then kick a bucket and rebel or something. What’s with these weird titles? Anyways, this is a pretty jazzy song, the main part being a sax and piano. It’s another nice, relaxing song with some emotion and a good melody. A really nice, relaxing song. The type of nice, relaxing song I wouldn’t mind going out of my way to hear. I think you get my point. I lol’d at the track title. Aside from being the first vocal track on this album, this is a rock remix of their previous song “When they sing” which was on their previous album “When they sing vol.2” (redundant mirite?). Whereas the original was a more choral track with emphasis on layered vocals, this version strips away the layers for a more natural voice and a rock backing instead of the orchestral backing the original had, although the chorus still has the same amount of emotion the original had, stretching out the vocalist’s vocal range. I really liked the original, so it’s only natural that I really like this one too. Fun fact: The melody for this song was arranged into a certain EP6 BGM that played during *spoilers*’s rush towards the altar. You know the one. An awesome track with an incredibly cool piano in the intro that immediately catches your attention. It’s a pretty fast-paced orchestral track, and the emphasis on the fast piano sprinkled throughout the song really makes this song worth listening to. The slowdown is unexpected, but the transition into it doesn’t interrupt the song in any shape or form, as it quickly speeds back up again into the piano solo heard in the intro. I could definitely see this used as a BGM in Umineko, since it loops so well. The second vocal track in this album is a fast-paced rock song. Kind of. It’s that rock/orchestral fusion you see a lot in some Umineko related albums. It uses a lot of accidentals in some parts to create a sort of chaos in this song, and there doesn’t really seem to be a clear direction in it. There’s a sudden slowdown in pace around the middle where it goes into a short choral segment, then goes back into chaos with a…chaotic instrumental segment. The closing is kind of random, but I guess that goes with the chaos of this song. As for the vocalist, she’s pretty decent. I wouldn’t go out of my way to find other albums she sung in, but I don’t mind listening to her either. An orchestral track closes off this album. It’s a nicely composed track, making good use of different instruments. It uses quite a good number of instruments actually, violins, brass, wind, harps, xylophones, and percussion. It’s a really nice close-off to this album, with somewhat of a triumphant feel to it.